Our 10th international BioMedical Transporters Conference “SLC Transporters and Ion Channels in Drug Discovery and Preclinical Development” will be held from August 6 - 10, 2017, at the world-renowned Olympic Museum in the city of Lausanne, Switzerland. The extraordinary atmosphere and the breathtaking view over Lake Geneva and the Alps will contribute to a memorable 10th anniversary conference. Lausanne is known for its pleasant “way of life” and its special surroundings, offering relaxing walks through the adjacent woods and the vineyards , that are on the UNESCO World Heritage List. 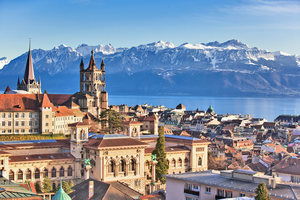 Thus, Lausanne is both a popular tourist destination and an ideal congress location. The organizers have put special emphasis on bringing together a heterogeneous, interdisciplinary group of attendees, consisting of representatives from both academia (biology, pharmacy, chemistry, medicine, computational biology) and the pharmaceutical industry. Our BioMedical Transporters conferences help bundle expertise in the transporter/channel field, in order to ensure maximal benefit for human health. The specific focus will be to review the scientific progress and therapeutic perspectives related to SLC solute carriers and store-operated calcium channels. Prof. Kathleen Giacomini PhD, University of California, San Francisco, will serve as our keynote speaker. Her topic will be "Genetic Variants in Membrane Transporters: Implications for Human Disease and Drug Response". Prof. Giacomini is a world-leading expert in studying the pharmacological importance of SLC solute carriers, as they play major roles in drug efficacy, by regulating drug disposition and distribution. Her work furthermore focusses on the influence of genomic variations of transporters on the efficacy of the action of therapeutic drugs. We have invited world-famous female speakers and session chairs. Female conference attendees, who are at an early stage in their scientific career, will have an opportunity to speak to those female “career role models”, in order to receive guidance and encouragement for the planning of their scientific careers in the membrane transporter field. Promotion of young investigators: Considering the feedback from previous conferences, instead of having a separate young investigators session, the conference organizers will invite - based on poster abstract submission - young investigators to give presentations in each session. In addition, there will be poster awards based on ~60 posters displayed. A dedicated committee will review the quality of the posters in terms of scientific merit, innovation and performance during poster presentation. Three awards will be issued for the best presentations. Young investigators, including members of NCCR TransCure, will greatly benefit from these activities, as this will enhance scientific networking, allowing them to interact with the opinion leaders in their fields. Maximizing scientific interactions: The conference also includes two excursions. As in previous conferences, these entertaining activities are always highly appreciated by the attendees. They provide a wonderful opportunity to maximize scientific interactions among scientists from academia and industry in a relaxed atmosphere. We are convinced of having put together an attractive scientific program that, we believe, will be appealing to a broad, international, and interdisciplinary audience in the field of membrane transporter research. The diversity of participants and speakers will serve to enhance networking between scientists from different countries and disciplines. The conference will be beneficial to scientists from both academia and industry and will provide a great opportunity to them to discuss university-industry collaborations. Swiss National Center of Competence in Research, NCCR TransCure Session “Applying excellence in membrane transporter research to the treatment of human diseases”.